When most people hear rhubarb their thoughts immediately turn to strawberry rhubarb pie (which I love by the way). You probably see a lot of rhubarb around the produce departments of markets this time of year since strawberries are in season now, but there are lots of other things you can do with rhubarb besides making great desserts like sorbet, compote or pie. I came across this recipe in the New York Times recently for a simple way to jazz up a chicken dinner with some rhubarb, scallions and honey for a bit of a different flavor. 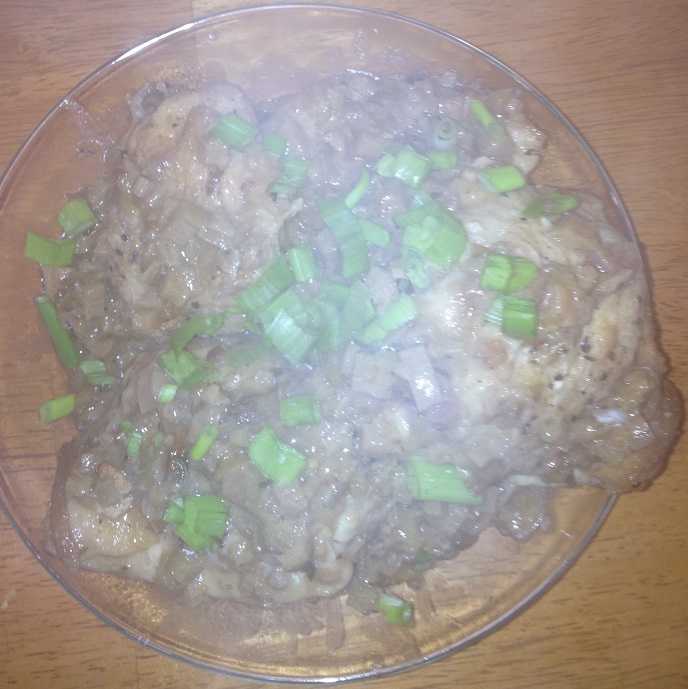 While this recipe uses a whole chicken cut into pieces, I made just chicken thighs instead but you could use any chicken pieces you like for this recipe. Pat the chicken dry with paper towels and season the chicken with 1 tablespoon of the kosher salt and 1 teaspoon of the black pepper. Place the chicken in a bowl with the thyme sprigs and cover it with plastic wrap. Refrigerate the chicken for at least 1 hour and up to overnight. Heat the olive oil in a large skillet over medium-high heat. Remove the thyme from the bowl with the chicken and reserve the thyme sprigs. Add the chicken pieces to the skillet and sear, turning them occasionally, until the chicken is golden brown all over, about 10 minutes. Transfer the chicken pieces to a platter and set them aside. Reduce the heat of the skillet to medium. Stir in the scallions (the white and light green parts) and cook until the scallions have softened, about 5 minutes. Add the garlic and the reserved thyme sprigs. and cook until fragrant, about 1 minute more. Stir in the wine and bring the mixture to a simmer, scraping up any browned bits in the bottom of the pan. Add the rhubarb, honey, 1/2 teaspoon of kosher salt and a few grinds of black pepper. Return the chicken pieces to the skillet in a single layer. Cover the skillet and reduce the heat to medium-low. Simmer until the chicken is cooked through, about 15 to 20 minutes for breasts and 20 to 25 minutes for the thighs and drumsticks. Transfer the chicken pieces to a platter as they finish cooking so they can rest. Whisk the butter into the rhubarb sauce. 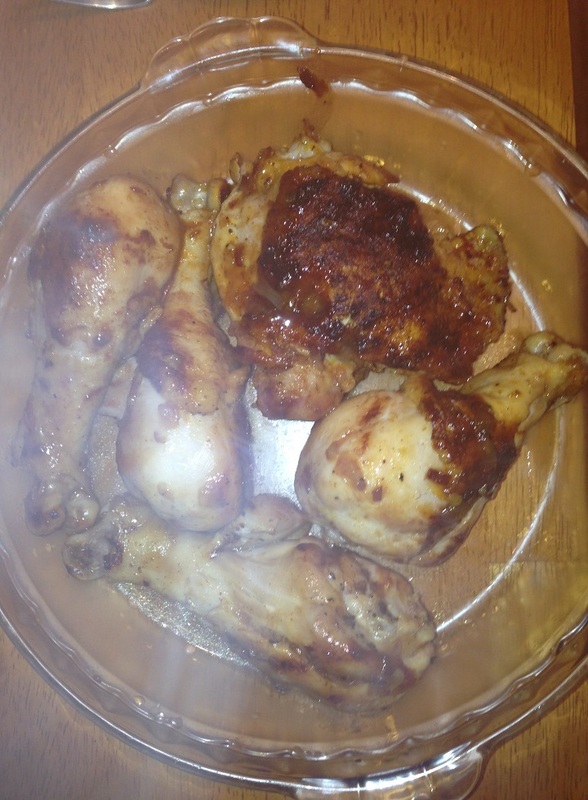 Taste the sauce and adjust the seasoning if needed or desired. Spoon the rhubarb sauce over the chicken pieces and garnish the dish with the sliced scallion greens and serve. It is a very simple dish that is perfect for a weeknight or a weekend meal. The rhubarb tastes great with the chicken and we all loved the sauce. It was ideal to spoon over the chicken and also with the rice that I had served with the meal, but it would also be great with mashed potatoes or other grains as well. I apologize for the picture as it didn’t turn out that great since there was still steam coming up off the dish when I took it, but trust me it tastes great and looks good too! An All-American Cookout | SAVEUR. As Independence draws closer, you may be having a cookout or party of your own and want to make the event as All-American as possible. Saveur magazine has some great menu ideas for you that cover all the basics for you with burger, salad, dessert and more. Check it out! I am taking a long weekend to visit some family so I will be back to blogging on Monday, June 30th with more recipe to share. There’s always lots going on, so check back and see what comes up next. Enjoy your weekend! Michelle had asked me what I wanted for a Father’s Day dinner last week and I knew what I wanted for dessert right away. I love desserts that make use of bananas (see the Bananas Foster cake Michelle made for my past birthday) and I had just recently seen this recipe on the Food Republic website for an awesome looking banana upside down cake. I have tried pineapple upside down cake and peach upside down cake so this one seemed like it would be just as good and was not going to be hard to make. I was really looking forward to it and was not disappointed with the results. Preheat the oven to 325 degrees. Generously butter the bottom and sides of a 9-inch diameter springform cake pan then line the pan with parchment paper. To make the banana caramel, put the sugar and 2/3 cup of water in a heavy saucepan and cook the mixture over high heat until the sugar has dissolved. Let the mixture boil until it has thickened to a golden-brown caramel, taking care not to burn it. Remove the caramel immediately from the stove and pour it into the prepared cake pan, tipping the pan slightly from side to side until the pan is evenly coated. Peel the bananas and halve them lengthwise. Arrange the bananas over the caramel in a neat pattern, trimming the bananas as necessary, then dust the bananas with the ground cinnamon. For the cake batter, sift together the flour, baking powder and cinnamon in a large bowl. Put the egg whites in a separate clean bowl and whisk the egg whites using an electric hand mixer until stiff peaks have formed. Put the butter and the sugar in another large bowl and whisk them together until the mixture is light and fluffy. Slowly whisk in the egg yolks into the butter-sugar mixture one at a time until combined. Fold in the mashed bananas, followed by the dry ingredients in the flour mixture. Fold in the egg whites into the entire mixture and gently mix to form the batter. Pour the batter into the cake pan and spread the batter evenly with a spatula. Bake the cake in the oven for 50 to 60 minutes, or until a skewer inserted into the center of the cake comes out clean. Remove the cake from the oven and allow it to cool for 5 minutes in the pan before unmolding it. The cake is easier to unmold while it is still warm before the caramel has had a chance to cool and harden. Run a thin knife around the inside of the pan. Put a large flat plate over the top of the cake pan and, holding the pan and the plate, invert it and gently lift off the pan and peel off the parchment paper. Serve the cake warm. 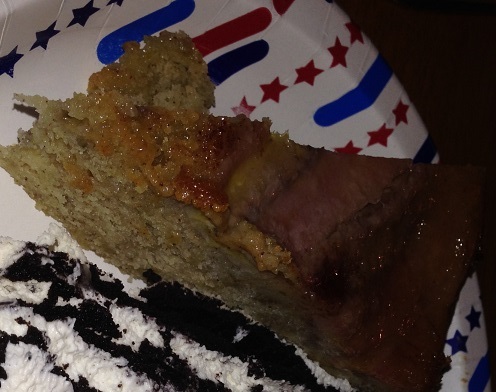 Wow, this cake tasted really good! It was kind of a mix of really moist banana bread with the caramel you have on a typical upside down cake except it is chock full of banana flavor. Put some homemade whipped cream on top of the cake and you have yourself a masterpiece. I loved every bite of it and the cake stayed moist for a couple of days afterward to provide a wonderful snack each night. We will definitely be making this one again and I think it would be great to make to bring to a party, housewarming or summer barbecue. One of the things I always seem to buy when I go to the farmer’s market is pretzel rolls. There is just something about these rolls with their great pretzel flavor, crusty top and the pretzel salt that just make them fantastic for all kinds of sandwiches and burgers. That being said, I decided that they shouldn’t be that hard to make on my own and wanted to give it a shot for when we were having burgers the other night. I found this recipe on Food Republic that was a pretty easy recipe, only used a few ingredients and looked pretty easy to do, so I thought I would give it a shot. 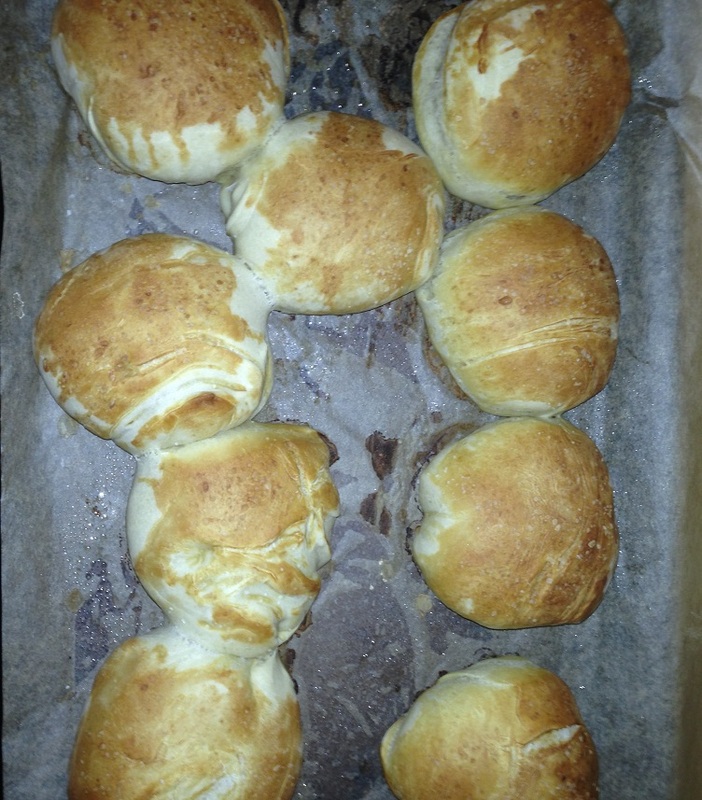 This recipe actually makes 35 small dinner rolls, but I halved the recipe and made larger rolls and got 9 good-sized rolls out of it. This is the original recipe posted on Food Republic, so you can adjust it to fit your needs if you want. In a mixer fitted with a dough hook attachment, briefly blend the yeast, warm water and 1 teaspoon of the granulated sugar. Let the mixture rest about 10 minutes so it can bloom to activate the yeast. After the yeast has activated, add the flour, the remaining sugar, the kosher salt and the oil. Mix for 5 minutes or until a smooth, dense dough has formed. Remove the dough from the mixer and transfer it to a greased medium-sized bowl. Let the dough rise in a warm place for 2 hours or until the dough has just about doubled in size. Line a baking sheet with parchment paper and spray it with some nonstick cooking spray. Divide the dough into 3 equal pieces and roll out each piece into a rope that is about 2 inches in diameter. Cut each rope into 1-inch pieces (larger if you are looking for bigger rolls). This should give you roughly about 35 small dinner rolls. Place the rolls on the prepared baking sheet about 2 inches apart. Cover the rolls with a clean dishcloth and let them rise again for about 30 minutes. Heat the oven to 425 degrees. in another bowl, combine the baking soda and the 2 cups of warm water. Transfer the baking soda solution to a spray bottle and spray the rolls generously with the solution. Sprinkle the rolls with some extra kosher salt if desired. Bake the rolls for 15 minutes until the rolls are a dark brown all over. Remove the rolls from the oven and allow them to cool on the baking sheet before serving. It is a very easy recipe, easier than some of the pretzel recipes I have seen, and it yields great results. The rolls were nice and crunchy on the outside and warm and sweet on the inside, just like a pretzel. They were perfect for the burgers that night and we used the extras for sandwiches for the rest of the week as well. I will certainly make this one again since it was so easy to do. There are so many different variations of coleslaw that it seems you can try it in just about any manner with any kind of ingredient. As long as it has some form of cabbage in it, slaw seems to be fair game today. For me, I love to have a slaw that is crispy and wet and soggy and full of mayonnaise. Don’t get me wrong – I like a coleslaw that uses mayo but I don’t want the vegetables swimming in it. It takes away from the flavors of the cabbage and other vegetables and it isn’t very practical as a summer side dish if you use a lot of mayo and can’t leave the dish out for a bit on a table. This particular recipe I picked up from the New York Times and Sam Sifton and it makes use of an item that you probably throw away most of the time – pickle juice. Cut the green and red cabbages in half and remove the core from each of the sides. Cut each half of cabbage in half again and slice each quarter of cabbage into very thin ribbons. Mix the red and green cabbages with the grated carrots and sliced apples in a large, non-reactive bowl. In a separate bowl, whisk together the mayonnaise, pickle juice,Dijon mustard, cider vinegar,hot sauce, kosher salt and black pepper until well blended. Pour the dressing over the cabbage mixture and toss the cabbage well to coat it. Season the slaw with salt and pepper to taste. The coleslaw may be covered with plastic wrap and refrigerated until you are ready to serve it. Toss the coleslaw again before serving. Alternatively to slicing the heads of cabbage and grating the carrots yourself you could just as easily use a bag of coleslaw mix that already has all of this done for you. Choose some apples that have good flavor to them and you get even a little bit more taste into the slaw. This slaw has just the right bite to it from the pickle juice and the hot sauce and I loved the way it all mixed with the cabbages and apples. It only seemed to get better after a day or two in the fridge as well, making a great side dish for all kinds of burgers, hot dogs, ribs, sandwiches and more. 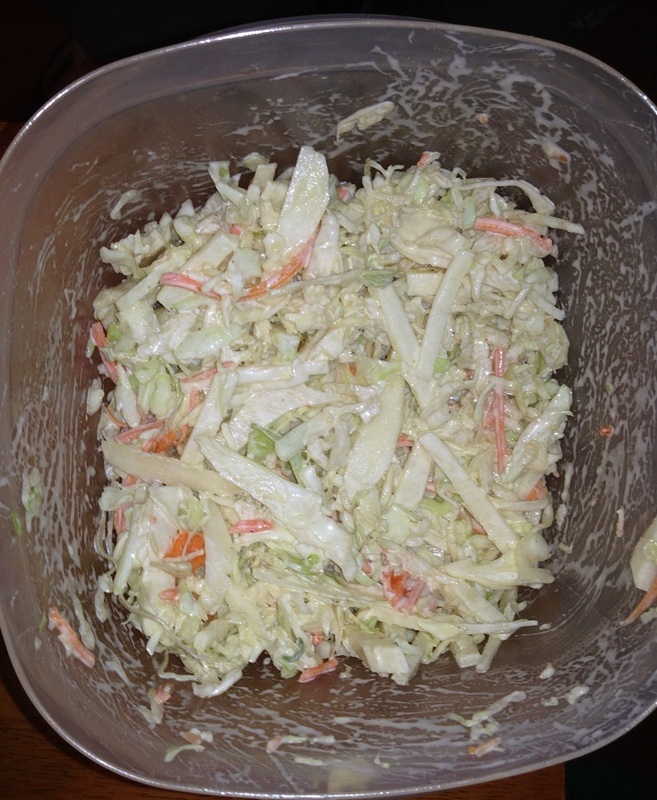 of all of the coleslaw dishes I have made recently, this one seems to be one of the best choices and I have made it a couple of times since I tried the original. That’s all I have for today. Check back again next time for another recipe. Until then, enjoy the rest of your day and enjoy your meal!